Effective time management is a necessary life skill and an essential business skill. To be able to manage your time effectively, you need to be have clearly defined objectives, and a high level of motivation towards the achievement of those goals. It requires a clarity of focus and a single mindedness of purpose. In a change management context this becomes even more important because additional factors are at work. It is not enough for a change leader to operate in the single minded pursuit of clear objectives. Successful change management requires a much wider field of vision than the typical execution of management by objectives. 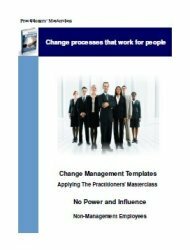 Effective time management in the leadership and management of change demands a clear understanding of the complex and multi-dimensional nature of successful organisational change. "I am personally persuaded that the best thinking in the area of time management can be captured in a single phrase : Organize and execute around priorities." Understanding what is truly important as opposed to what is presented as urgent is essential. 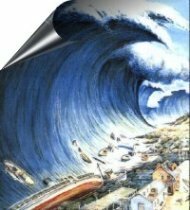 Things that are important and urgent usually fall into the category of emergencies and unforeseen events, and should not be regular occurences. At the other end of the spectrum, things that are urgent but not important are a defocus and distraction. 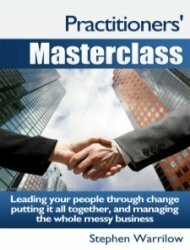 The successful leader or manager - and especially one involved in organisational change - will make the time and take the time firstly to determine what is truly important, and then secondly to ensuring a successful execution of this identified priority. Despite out best endeavours many of us will from time to time find that we do not use our time effectively - to put it bluntly - we prevaricate and we procrastinate. Put simply, we just don't do it - we put off doing what doing what we know we need to do. There are many useful tools and techniques for effective allocating and managing your time, and you will find some of these resources listed below, but it is worth pausing for a moment to consider what we experience inner - and usually unconscious resistance to doing what we know we should be doing. Understanding this dimension is especially inportant when you are leading or managing organisational change. You need to be aware of your own blind spots and have (or develop) the capacity to identify your own inner personal resistance. 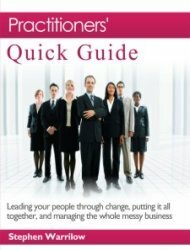 Successful change leadership and change management will take many - probably most - senior executives way out of their comfort zones firstly with the levels of self awareness and emotional intelligence that will be required of them; and secondly with the self imposed relinquishment of a considerable amount of their familiar centralised command-control management styles. Kegan and Lahey define this as "Immunity to Change" - in summary, this is your own personal inner resistance (or as they call it "immunity") to change which see as a "hidden commitment" - an underlying root cause, that competes and conflicts with your stated objective. Thus effective time management also requires a very clear understanding of what our unconscious or hidden commitments really are. 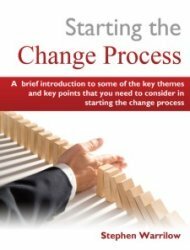 Return from "Effective Time Management" to: "Starting the change management process"